A university is an institution of higher education and research, which grants academic degrees at all levels ( bachelor, master, and doctorate) in a variety of subjects. A university provides both tertiary and quaternary education. The word university is derived from the Latin universitas magistrorum et scholarium, roughly meaning "community of masters and scholars". 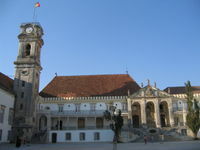 The tower of the University of Coimbra, the oldest Portuguese university. Degree ceremony at the University of Oxford. 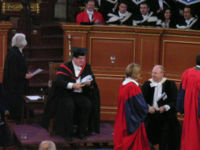 The Pro-Vice-Chancellor in MA gown and hood, Proctor in official dress and new Doctors of Philosophy in scarlet full dress. Behind them, a bedel, another Doctor and Bachelors of Arts and Medicine. Relative to the above definition, there is controversy as to which university is the world's oldest. The original Latin word "universitas", first used in time of renewed interest in Classical Greek and Roman tradition, tried to reflect this feature of the Academy of Plato. If we consider university simply as a higher education institution, then it could be Shang Hsiang, founded before the 21st century BC in China according to legend. Later Taixue and Guozijian serve as the highest level of educational etablishment while academies became very popular as non-governmental etablishments teaching Confucianism and Chinese literature among other things. The choice for the oldest university is usually among Nalanda, Constantinople, Al Karaouine or Al-Azhar universities. Nalanda University, founded in Bihar, India around the 5th century BC conferred academic degree titles to its graduates, while also offering post-graduate courses. Another Indian university whose ruins were only recently excavated was Ratnagiri University in Orissa. Al-Azhar University, founded in Cairo, Egypt in the 10th century, offered a variety of post-graduate degrees, and is often regarded as the first full-fledged university. The University of Constantinople, founded in 849, by the regent Bardas of emperor Michail III, is generally considered the first institution of higher learning with the characteristics we associate today with a university (research and teaching, auto-administration, academic independence, et cetera). The Guinness Book of World Records recognizes the University of Al Karaouine in Fez, Morocco as the oldest university in the world with its founding in 859. The first European medieval university was the University of Magnaura in Constantinople (now Istanbul, Turkey), founded in 849 by the regent Bardas of emperor Michael III, followed by the University of Preslav and University of Ohrid (9th century) in the Bulgarian Empire, founded by Tsar Simeon I of Bulgaria, the University of Salerno (9th century), University of Bologna (1088) in Bologna, Italy, the University of Paris (c. 1100) in Paris, France, later associated with the Sorbonne, and the University of Oxford (11th century) in England. Many of the medieval universities in Western Europe were born under the aegis of the Roman Catholic Church, usually as cathedral schools or by papal bull as Studia Generali (NB: The development of cathedral schools into Universities actually appears to be quite rare, with the University of Paris being an exception - see Leff, Paris and Oxford Universities). 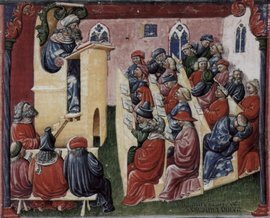 In the early medieval period, most new universities were founded from pre-existing schools, usually when these schools were deemed to have become primarily sites of higher education. Many historians state that universities and cathedral schools were a continuation of the interest in learning promoted by monasteries. In Europe, young men proceeded to university when they had completed their study of the trivium–the preparatory arts of grammar, rhetoric, and dialectic or logic–and the quadrivium: arithmetic, geometry, music, and astronomy. (See Degrees of the University of Oxford for the history of how the trivium and quadrivium developed in relation to degrees, especially in anglophone universities). The end of the medieval period marked the beginning of the transformation of universities that would eventually result in the modern research university. Many external influences, such as eras of humanism, Enlightenment, Reformation, and revolution, shaped research universities during their development, and the discovery of the New World in 1492 added human rights and international law to the university curriculum. By the 18th century, universities published their own research journals, and by the 19th century, the German and the French university models had arisen. The German, or Humboldtian model, was conceived by Wilhelm von Humboldt and based on Friedrich Schleiermacher’s liberal ideas pertaining to the importance of freedom, seminars, and laboratories in universities. The French university model involved strict discipline and control over every aspect of the university. Universities concentrated on science in the 19th and 20th centuries, and they started to become accessible to the masses after 1914. Until the 19th century, religion played a significant role in university curriculum; however, the role of religion in research universities decreased in the 19th century, and by the end of the 19th century, the German university model had spread around the world. The British also established universities worldwide, and higher education became available to the masses not only in Europe. In a general sense, the basic structure and aims of universities have remained constant over the years. Although each institution is differently organized, nearly all universities have a board of trustees, a president, chancellor or rector, at least one vice president, vice-chancellor or vice-rector, and deans of various divisions. Universities are generally divided into a number of academic departments, schools or faculties. Public university systems are ruled over by government-run higher education boards. They review financial requests and budget proposals and then allocate funds for each university in the system. They also approve new programs of instruction and cancel or make changes in existing programs. In addition, they plan for the further coordinated growth and development of the various institutions of higher education in the state or country. However, many public universities in the world have a considerable degree of financial, research and pedagogical autonomy. Private universities are privately funded having generally a broader independence from state policies. Despite the variable policies, or cultural and economic standards available in different geographical locations create a tremendous disparity between universities around the world and even inside a country, the universities are usually among the foremost research and advanced training providers in every society. Most universities not only offer courses in subjects ranging from the natural sciences, engineering, architecture or medicine, to sports administration, social sciences, law or humanities, they also offer many amenities to their student population including a variety of places to eat, banks, bookshops, print shops, job centres, and bars. In addition, most major universities have their own libraries, sports centers, restaurants, students' unions, botanical gardens, astronomical observatories, university hospitals and clinics, computer labs, research laboratories, business incubators and many other. The funding and organization of universities is very different in different countries around the world. In some countries universities are predominantly funded by the state, while in others funding may come from donors or from fees which students attending the university must pay. In some countries the vast majority of students attend university in their local town, while in other countries universities attract students from all over the world, and may provide university accommodation for their students. See also: List of colleges and universities by country. Front entrance to Texas Tech University in Lubbock, Texas. In the United States, there is no legal definition of the term "university." The usual practice in the United States today is to call an institution made up of undergraduate students a " college." This can be a two-year community college, which grants an AA or a four-year college, such as a liberal arts college, which grants a B.A.. An institution which is comprised of both undergraduate and graduate students (and often of several schools) is called a university. Some schools such as Boston College, Dartmouth College, and College of William and Mary, which offer a number of graduate programs, have retained the term "college" in their names for historical reasons. Similarly, some institutions granting few if any graduate degrees may be called universities for historical reasons. Another criterion used to distinguish between a college and a university in the United States is the balance of teaching and research that occurs in the institution. Colleges have historically focused on teaching and universities on scholarship and research. Sherman Hall at Western Illinois University in Macomb, Illinois. The Carnegie Basic Classification system distinguishes among institutions on the basis of the prevalence of degrees they grant. Formerly designated by Roman numerals, their current and past classification system uses the following names to designate institutions of higher education: Research I universities, Doctorate-granting Universities, Master’s Colleges and Universities, Baccalaureate Colleges, Associate’s Colleges, Special Focus Institutions, and Tribal Colleges, with subdivisions in some of the categories. As the category names indicate, the Carnegie Foundation considers the granting of master's degrees a prerequisite for an institution being classified as a university. Admission systems and university structures vary widely around the world (see college admissions). Differences are marked in countries where universities fulfill the role of community colleges in the United States and Europe. Colloquially, the term university may be used to describe a phase in one's life: "when I was at university…" (in the United States and the Republic of Ireland, college is used instead: "when I was in college..."). See the college article for further discussion. In Australia, New Zealand, the United Kingdom and the German speaking countries "university" is often contracted to "uni". In New Zealand and in South Africa it is sometimes called "varsity", which was also common usage in the UK in the 19th century. 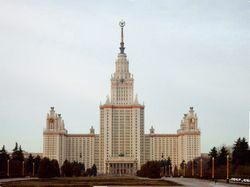 Moscow State University at Sparrow Hills is the largest educational building in the world. In his study of the American university since World War II, The Knowledge Factory, Stanley Aronowitz argues that the American university has been besieged by growing unemployment issues, the pressures of big business on the land grant university, as well as the political passivity and ivory tower naivete of American academics. In a somewhat more theoretical vein, the late Bill Readings contends in his 1995 study The University in Ruins that the university around the world has been hopelessly commodified by globalization and the bureaucratic non-value of "excellence." His view is that the university will continue to linger on as an increasingly consumerist, ruined institution until or unless we are able to conceive of advanced education in transnational ways that can move beyond both the national subject and the corporate enterprise. In some countries, in some political systems, universities are controlled by political and/or religious authorities, who forbid certain fields and/or impose certain other fields. Sometimes national or racial limitations exist - for students, staff, research. Books from university libraries, written by anti-Nazi or Jewish authors, were burned in places ( eg. in Berlin) in 1933, and the curricula were subsequently modified. Jewish professors and students were expelled according to the racial policy of Nazi Germany, see also the Law for the Restoration of the Professional Civil Service. Martin Heidegger became the rector of Freiburg University, where he delivered a number of Nazi speeches. On August 21, 1933 Heidegger established the Führer-principle at the university, later he was appointed Führer of Freiburg University. University of Poznań was closed by the Nazi Occupation in 1939. 1941- 1944 a German university worked there. University of Strasbourg was transferred to Clermont-Ferrand and Reichsuniversität Straßburg existed 1941-1944. Nazi universities ended in 1945. Soviet type universities existed in Soviet Union and in other countries of the Eastern Bloc. Medical, technical, economical, technological and artistical faculties were separated from universities (compare the List of institutions of higher learning in Russia). Soviet ideology was taught divided into three disciplines: Scientific Communism, Marxism-Leninism (mostly in form of Leninism) and Communist Political Economy) and was introduced as part of many courses, eg. teaching Karl Marx' or Vladimir Lenin's views on energy or history. Communist parties controlled or influenced universities. The leading university was the Moscow State University. After Joseph Stalin's death, universities in some Communist countries obtained more freedom. Patrice Lumumba Peoples' Friendship University provided higher education as well as a KGB training ground for young communists from developing countries.